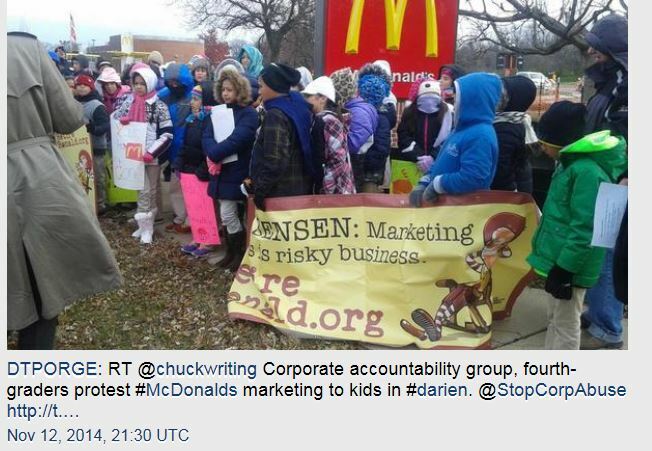 Forty-eight fourth-graders from a Chicago charter school joined forces Nov. 12 outside a Darien McDonald’s with representatives from a corporate accountability organization to protest McDonald’s targeted marketing to children. Fast food companies’ marketing to kids has gone unchallenged for far too long but that’s starting to change. What did it take to shift the public climate around R.J. Reynolds using Joe Camel to market cigarettes to kids? A “Send Joe Camel Packing” campaign eventually led to President Clinton, the American Medical Association, the Surgeon General and the Federal Trade Commission all voicing their opposition to the cartoon mascot. The time has come to send fast food mascots packing as well. Tags: #MomsNotLovinIt, #RonaldMcDonald, fast food, Marketing to children. Bookmark the permalink.